Our last cooking class for the season ended with the theme Sunday Roast Dinner, requested by my British neighbor. It is said that this traditional meal originated in the days where the King of England ruled over vast farmlands tended by serfs. The serfs had no freedom, worked the land for 6 days a week, with Sunday being their only "free" day. After Church service, the serfs were still required to practice war games to ensure that they would be able to protect their King in battle. The slaves were then rewarded in kind with a feast of ale and roasted ox. 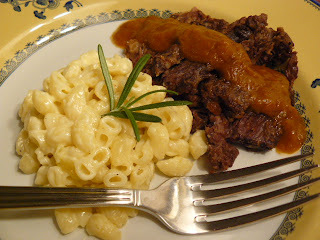 This recipe is adapted from Ina Garten, who uses the fairly inexpensive beef chuck to make a delicious Pot Roast. 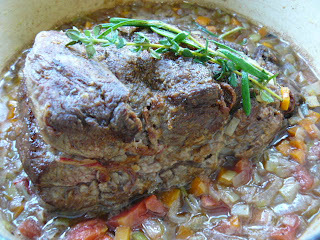 The ideal cut of meat for this type of roast should be marbled with fat and connective tissue to ensure moist slices of beef after hours of cooking. 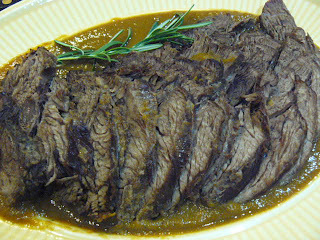 A Pot Roast will usually take at least 2 hours to tenderize, so be patient! 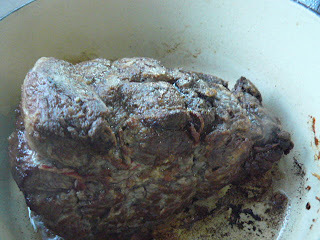 Preheat oven to 325 deg F/170 deg C.
Pat beef dry with paper towel. Season roast all over with salt and pepper. Dredge the whole roast in flour, including the ends. Sear roast in olive oil over medium heat for about 5 minutes, until nicely browned on all sides. Set aside. Sauté carrots, onions, celery, leeks, garlic, ½ teaspoon salt and pepper, for about 15 minutes until tender. Add wine and brandy, bring to a boil. Add tomatoes, water, stock cube, thyme and rosemary. Put the roast back into the pot; bring to a boil and cover. Place in the oven for at least 2 hours, or until the meat is tender. 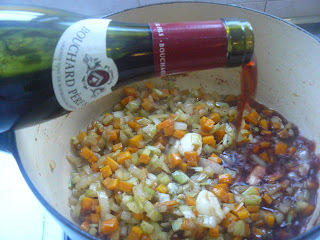 Transfer half of the sauce and vegetables to a blender and puree until smooth. (For a thicker gravy, puree all of the vegetables). Return puree back into pot, and simmer sauce over low heat. Add butter and taste for seasoning. Remove strings from roast and slice the meat. Serve with sauce spooned over it.